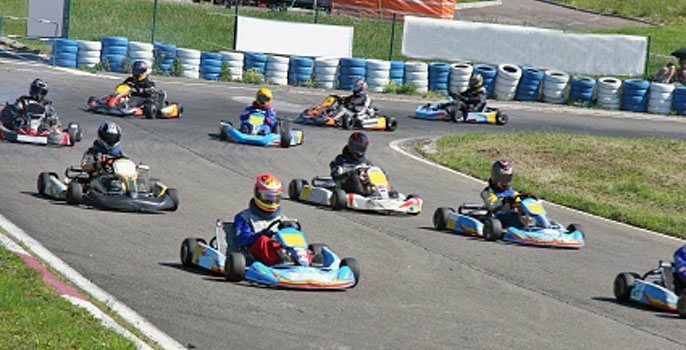 Directory of Go Kart Race Tracks and Karting Clubs Located in Florida. "The Souths Fastest Short Track" Dirt oval race track. Racing every Saturday night. Multiple karting race classifications. See website for details and race schedules. 200,000 Sq ft. facility that features go kart racing, roller rink, bowling alley, Bazooka Blast paintball / laser tag game, ropes course, food options and bar. The 1/2 mile asphalt indoor go kart race track encompasses 48,000 square feet of track space. Xtreme features EVO3 Gas Powered go karts by BIZ Karts. Specialty cadet children karts are available. Race analysis, driver time printouts and live results timing board. Pit Bar sports bar featuring large screen TVs, pool table and a full liquor bar. 5000 Sq ft. video arcade featuring Nascar simulators and 1,000 interactive games. All-American Café. Xtreme pro shop. Wireless high speed Internet access available. K1 Speed South Florida is an indoor go kart racing facility that features high-performance 20hp DC electric go karts. Autobahn Indoor Speedway is an 80,000 sqft indoor go kart racing facility located in Jacksonville, FL. The speedway features 2 unique Grand Prix style go kart race tracks. The racing karts at Autobahn are F1 inspired Italian built electric go karts. The adult karts are capable of reaching 50 mph. For younger racers junior go karts are available. The junior karts can reach up to 25 mph. Arrive and drive race sessions and organized adult and junior kart racing leagues are available. Special group, corporate event, and birthday party packages are availabe. The track is open for racing 7 days a week unless a private event is scheduled. See track website for additional information. Outdoor road course go kart track. Operating under World Karting Association Rules. Multiple karting race classifications. See website for details and race schedules. Dirt Oval and Asphalt Oval Go Kart Race Tracks. Races Every Saturday Night Gates Open at 4:00 PM Practice 5:00 PM Race 7:00 PM. 1/5 mile clay oval, 4 degree banking on corners, 2 degree on straightaways. World Karting Association Rules. K1 Speed Miami features indoor go kart racing 7 days a week. Track is conveniently located within 10 miles of the Miami Airport. K1 Speed features adult and junior electric racing karts. Birthday parties, groups, and corporate events are welcome at K1 Speed Miami. See track website for special event details reservation information. Ocala Gran Prix offers complete kart and track rental. Karts are Birel chassis with 9.0hp Honda Engines. All karts are governed evenly to a speed up to 50 MPH! The track at Ocala Gran Prix is 6/10 of a mile, 7 turns, 30 feet wide, and incorporates a 1/5 mile asphalt oval. European style Kart racing in Orlando Florida. K1 Speed Orlando features electric, emissions free karts that can reach speeds of 45 mph. Arrive and drive kart racing and karting leagues are available. Groups, birthday parties & corporate events are welcome. Multi-turn outdoor road course kart track. Kart rentals and group rates available. The facility includes a 1-mile test track, a lake, 22 garages on pit lane, a full-service karting store and Andersen Racing's immaculate 8,000-square-foot shop where professional open-wheel race cars are prepared. The track is adaptable to many configurations, and its slow and medium speed corners are designed to challenge drivers of both karts and small formula cars. Training and testing programs geared toward all ages and skill levels are available. 3/8 mile banked asphalt race track. The speedway operates primarily on Saturday nights with a full slate of stock car racing, with sprint cars and karts on special occasions. Track is located at the Charlotte County Airport on Piper Road in Punta Gorda, Florida. Submit a Florida Go Kart Track! To have your Go Kart Track listed or to update our information please Contact Us.